Since its inception in the 1960s the world of snowboarding has divided into many facets. From originally just being a way for getting from the top of the mountain to the bottom it has now diverged down many paths. How Do You Choose Your Board? There are now several disciplines of the sport; freestyle, freecarve, alpine racing, backcountry, boarder-cross, rail riding, half pipe, as well as combinations of these, for example, taking freesylte terrain park tricks and performing them in natural backcountry terrain is now commonly seen in snowboarding magazines and movies. 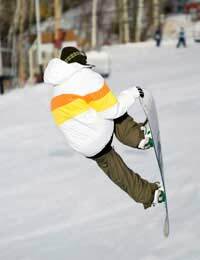 Each aspect of snowboarding is unique and requires slightly different skills to another. So how does the average snowboarder, who wants to try a little bit of everything, choose a board that will allow him to hold his own in the terrain park and pipe, whilst still letting him surf steep and deep powder and cruise packed piste? The answer lies in the all mountain freeride snowboard. As the name suggests, a freeride board takes elements of design from all disciplines and combines them to produce a snowboard which allows riders to tackle almost any snow condition or type of mountain terrain. The slight drawback to such a board is that by being a “jack of all trades” a freeride board is a “master of none”, yet for the average recreational rider, it allows great freedom of choice on the slopes. Professional powder hunters choose long “powder guns” – specifically designed for floating on top of deep light snow. Professional Alpine racers use narrow carving boards which allow precision control and are designed for high speeds. Professional freestylers use shorter, more flexible boards, to gain height and allow them to spin more easily. But, each of these boards performs well only in its own defined area. A carving board would sink in powder. A freestyle board would come last in a slalom race, and a powder gun would be useless in the half pipe. A freeride board bridges the disciplines and is thereby the more versatile design of snowboard . The vast majority of recreational snowboarders use freeride boards, and this type of board owns by far the biggest share of the snowboard market. Do I Need More Than One Board? Some snowboarders have two or more boards which allows them to choose the one most suited their preferred riding style or snow conditions on any given day. If they are planning on spending all day in the terrain park, they’ll grab their short freestyle board. If it’s a powder day, out comes the powder gun. Many snowboarders also keep an old board used exclusively for rails or early and late season snowboarding. Often known as a “rock” or “rail” board – this allows them to ride in less than perfect conditions, often when rocks are exposed without damaging their better boards. Because the rock board is already old, scratched and scarred, putting a few more dings and dents in the edges and base is no big deal. So, unless you have your heart set on being the next Shaun White, or you only want to ride back country powder, it is best to purchase an all mountain freeride board, which will allow you to enjoy all of the many aspects of snowboarding.